Clarence Kailin was a Wisconsin activist. He died in 2009 age 95. Clarence Kailin, one of the last surviving Americans who fought from 1936 to 1939 in the Abraham Lincoln Brigade, for the pro-Soviet Spanish government against Francisco Franco allied with Adolf Hitler and Benito Mussolini. Kailin was called a 'premature antifascist' by F.B.I. director J. Edgar Hoover. In December 1984, a delegation of 19 Soviets toured the United States, in Madison Wisconsin they were hosted at a dinner by the local branch of the American-Soviet Friendship Committee, led by Madison fire chief Ed Durkin and activist Clarence Kailin. Mike Murray, a student of water chemistry from Denver attended the dinner, as did 28 year old mother of two Sue Bunge-Quigley, a former teacher, turned graduate student. Jim Lackore, a teacher of Russian at Madison Memorial High School acted as interpreter. 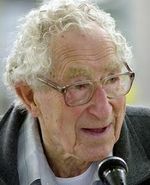 In 1991 Clarence Kailin, Wisconsin, was one of several hundred Communist Party USA members to sign the a paper "An initiative to Unite and Renew the Party"-most signatories left the Party after the December 1991 conference to found Committees of Correspondence. Clarence Kailin signed the letter, from the Colombia Support Network . This page was last modified on 14 December 2017, at 21:22.